Our last stop for the day -- as the sun was begining to set -- was near the Bluewater Bridge. South of the bridge is a Coast Gaurd Station in Pine Grove Park which is partial visiable from the riverwalk. Moored at the Coast Gaurd Station is The Hollyhock -- a Buoy Tender Ship. 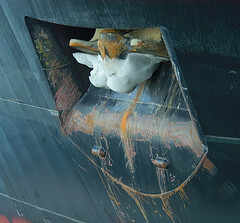 This ship and her crew are charged with minding the buoies in the Great Lakes. 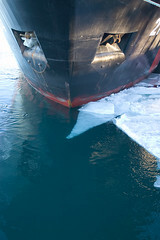 Ice covers the anchor of the buoy tender. 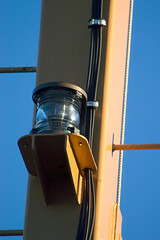 Using the 80-400mm lens I was able to grab this stunning image of a light on a mast of the ship. Sunset brings out the best colors. I shot all my Nikon D100 photos in camera RAW. The images are brought into PhotoShop CS through the Adobe Camera RAW filter. I will touch-out dirty and dust that might have settled on the sensor (and in these Port Huron photos I did have a few major bits of debris), but other than that I normally don't do anything to the images. The one notable exception is the Bastille Bridge in Port Huron -- there was an aweful white Christmas decoration at its peak that just had to be removed. Its always a good idea to try different settings and compositions on a subject. Unfortunately we don't always have that luxury so we're forced to stick with the "safe" shot. The better the camera the less like it is to interfere. One of the worse things is the cheap cameras that have a 3+ second delay between the time you hit the shutter release and the time the exposure begins. hmm.. I'm still learning and trying my best in photography. Just an amateur young photographer. Hope ya won't mind in giving me some useful hints. Thanks! But, i think my digital camera isn't an advanced camera. Plz tell me : if the faster the shutter speed, the lower the picture quality? What's the difference between center-weight and center-spot? What about center-zone? What's long time exposure? What are the effects of long time exposure. Will it do harm to my lens(?) if i expose it for too long? Thanks. Q: if the faster the shutter speed, the lower the picture quality? A: No. You might be thinking about the depth-of-field though. The faster the shutter speed, the large the aperture (F-stop) must be (larger apertures have lower numbers). Larger aperture settings shorten the distance that will appear to be in focus. Smaller aperture (F-stop) settings will increase the distance that will appear to be in focus. Landscape photographers look for the smallest possible aperture so that everything visible in the photograph is in focus. Macro (close-up) photographers frequently use larger apertures to limit the amount of the image that's in focus directing the viewer's attention to the subject. There's a number of sites on the web that have examples of depth-of-field that you might want to look through. Q: What's the difference between center-weight and center-spot? What about center-zone? A: Many of the current cameras have multiple metering modes. Which are available on which cameras varies within the menufacturer's camera lines. In general though, the spot meter takes the meter reading from the center of the frame (typically marked in the viewfinder by a circle or rectangle). The center-weighted metering varies on some cameras but normally averages the exposure over the larger circle in the viewfinder. The manual for your camera should explain these metering modes. Q: What's long time exposure? A: I assume that you're asking about time exposures. This refers to long exposures to allow the film or sensor enough light to properly develop the image (typically at night or other low light situations). The breaking point at which time exposure begins varies depending on which authority you listen to, but it is always at a long enough exposure time that a tripod is necessary to keep the camera stable enough to make out the image. The result should be a properly exposed image from little light. Most cameras will not support longer times than a second (though most SLRs will support multiple second exposures in manual modes) making the use of a locking cable release mandatory. This had been one of my favorite photographic field trips though -- I'd head out to a location after dark with slow film (the slower the film the less significant the grain) and set-up for time exposures of 5-30 minutes. Others have spent hours shooting cityscapes at night with time exposures to capture the lights from buildings with the headlights and taillights of cars streaking through the streets. If you're planning on attempting this trick, make sure to mount the camera on a good tripod, make sure to use fresh batteries, set the self-timer (to allow any shaking you might encourage to subside), and don't touch the camera from the time you hit the release till the exposure is complete. Q: What are the effects of long time exposure. Will it do harm to my lens(?) if i expose it for too long? A: There should be no effect on the lens or camera. There are many cameras that may not support the long exposures.